Live or work in Davis Islands? Need to get rid of some unwanted junk, debris or clutter? Well if any of these fit you, then I have the perfect solution to your junk problems, The Stand Up Guys Junk Removal Crew. The Stand Up Guys are the number one junk removal service in Davis Islands and that comes from the people of Davis Islands themselves. The Stand Up Guys offer a full junk removal and hauling service to all of Davis Islands and all the surrounding areas. 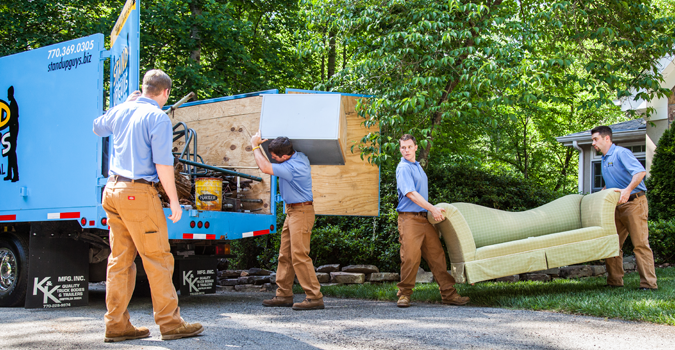 We remove and haul all types of different things, from old appliances and furniture to yard debris and construction debris. Pretty much, you name it and we’ll remove it, it’s that simple. Along with removing and hauling anything you want, The Stand Up Guys Junk Removal Crew also offer the best customer service in the industry. We strive to go above and beyond your expectations and make sure you are 100% satisfied every single time. This means we show up on time, are polite and respectful to you and your home, offer affordable prices and always leave our customers happy. Davis Islands is a large Tampa neighborhood set up on two islands inside Hillsborough County. Davis Islands have beautiful views of both Downtown and the Port of Tampa and has become a very exclusive place to live. There are well over 5,000 happy residents inside Davis Islands with over 2,5000 homes. Davis Islands has it’s very own airport and is also well-known for it’s spectacular Yacht Clubs like The Davis Islands Yacht Club. Davis Islands also has a well established business district known as East Davis Blvd. The Stand Up Guys cover all of Davis Islands from our central location at 1907 W. Kennedy Blvd, Tampa, FL 33606., call us anytime to schedule an appointment at 813-512-0480.